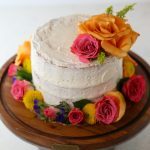 Naked Lemon Cake with Fresh Flowers is a three-layer, gluten free lemon cake with lemon infused buttercream frosting. The cake is moist and has the perfect amount of lemon flavor. Spring is finally here! Did you think it would never come? Do you feel like it’s been the longest Winter ever? Me too. Flowers are blooming everywhere and I’m in heaven. They’re so beautiful! I especially love them on cake! We recently had a potluck game night party and needed a dessert. 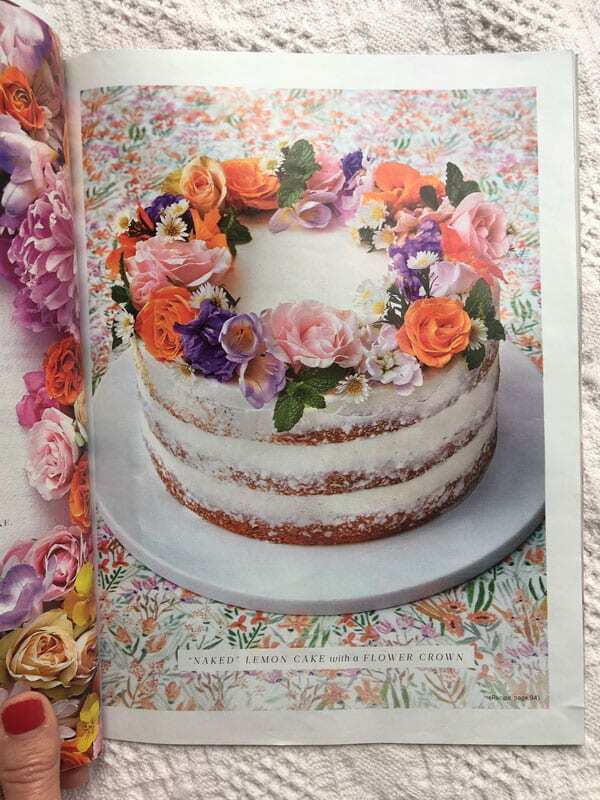 I found a lovely article on garden party cakes in the current Southern Living magazine and just had to make one. Since our daughter can’t have gluten, I wanted her to be able to eat it too. 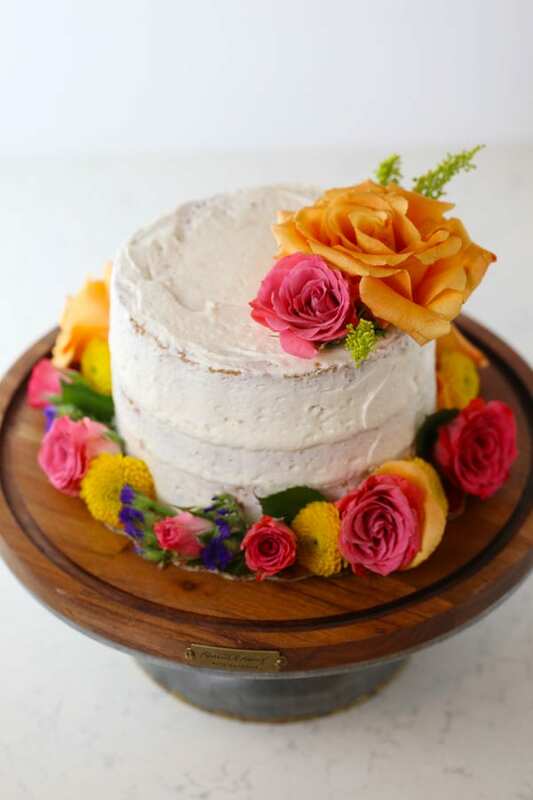 I made this Naked Lemon Cake with Fresh Flowers and it came out so well! The cake itself is moist and so lemony! Everyone at the party just loved it. The combination of the lemon cake with the lemon buttercream was superb. And my guests didn’t even know that it was gluten free. Shhhh! The potluck game night was a success as well. Everyone brought an old fashioned casserole to share, then we played a game that is called Celebrity or maybe it’s called the Name Game. I’m not sure. This is how it’s played. Each person writes down about 10-15 names of famous people. Place the names, folded up into a big bowl. Break up into teams of two. Take turns timing each team for one minute as one team member draws a name, then the other team member asked them questions to figure out the person. They can only ask yes or no questions which makes it a little more tricky. The famous people can be actors, athletes, politicians, musicians, etc (dead or alive). Fun game! Back to the cake. 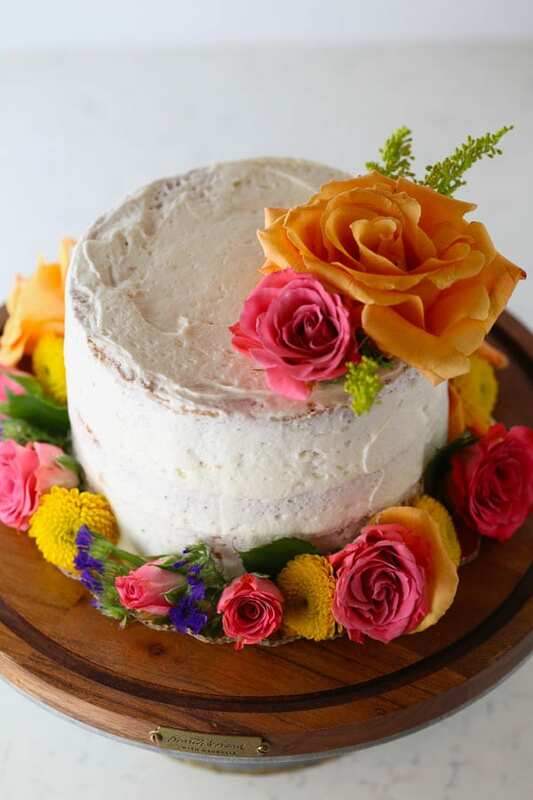 I used fresh flowers from my local grocery store to decorate the cake. I simply chose flowers that I liked. I’m not sure if they are edible. I just rinsed the stems with water, dried them and inserted into the cake. Then we removed the flowers before eating the cake. It is possible to find edible flowers but I couldn’t find them. I found the pretty cake stand at Target. It’s a new line by Joanna Gaines called Hearth & Hand with Magnolia. 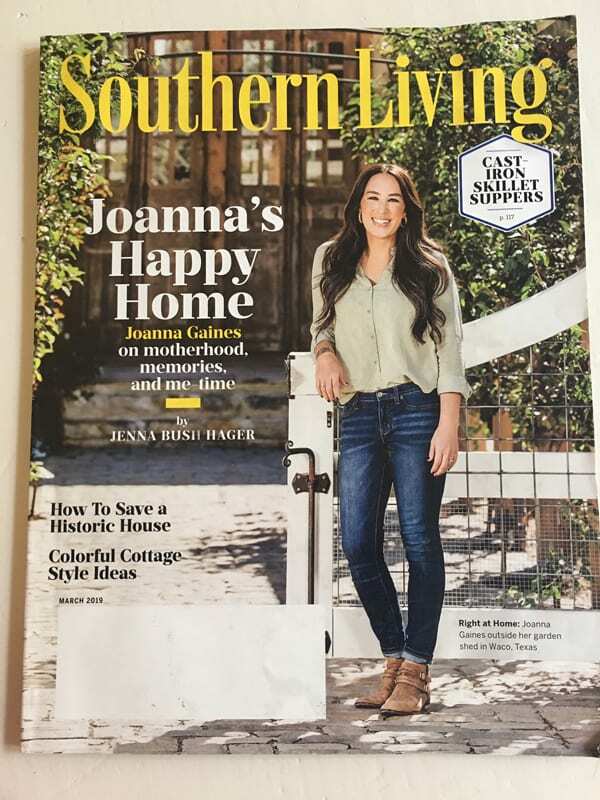 She just happens to be on the cover of Southern Living magazine too. She’s everywhere! 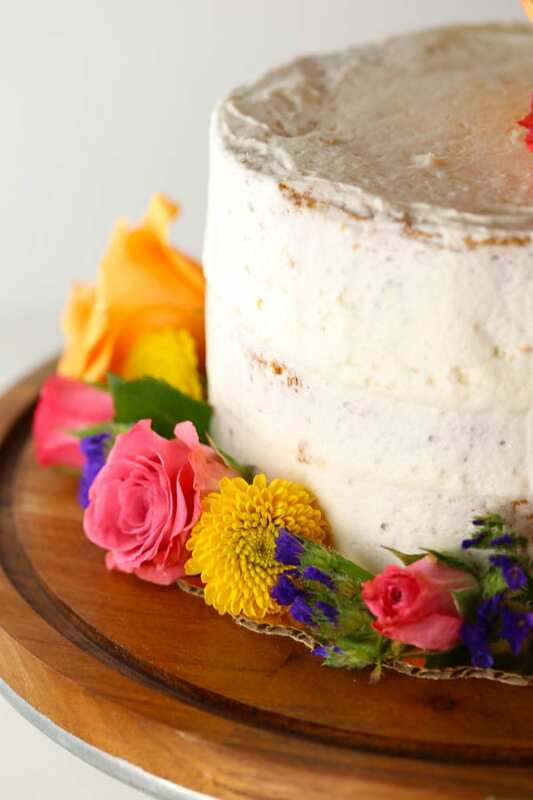 Full recipe for the Naked Lemon Cake with Fresh Flowers is below. Enjoy! 2 cups (275g) "My Favorite Gluten Free Flour Mix"
Preheat the oven to 350°F with a rack in the center. Line three 6-inch round cake pans with parchment paper, spray with cooking spray (underneath paper as well). Set aside. Measure flour by spooning into a measuring cup and lightly sweeping the excess off. Or you can weigh the flour. In a small bowl, combine the flour, salt and baking powder. Whisk together until combined. Set aside. In a large bowl, beat the eggs, sugar and lemon oil with an electric mixer using the whisk attachment until thickened and a light golden color. About 2 minutes at medium high speed. The batter should fall in thick ribbons from the beaters. Add the dry ingredients to the batter and mix by hand, just enough until combined. Scrape bottom and sides of the bowl, then mix again briefly to fully incorporate. With mixer on low, slowly add boiling water, melted butter and oil. Let it mix until batter is combined. Divide the batter evenly between the 3 pans. Bake the cakes until a toothpick inserted into the center comes out clean and the top feels set. About 40-45 minutes. Add powdered sugar, lemon juice, and water with the mixer running on low. Increase to high speed and beat for 3 minutes. Fill and frost the cake, scraping the sides slightly to reveal some of the cake underneath to give it the "naked" look. 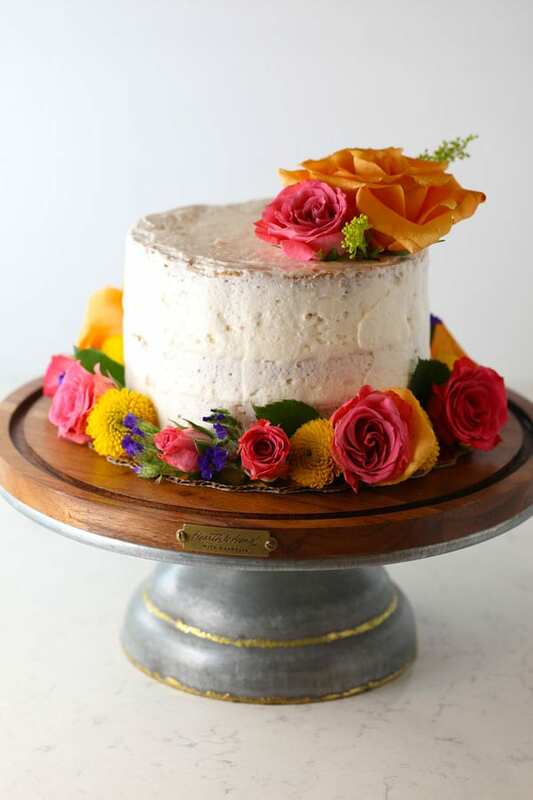 Garnish with fresh, edible flowers or use flowers recommended by your florist that are safe to use on cake.